It really is better to be a human than an insect. We don't have to deal with anything as horrible-sounding as "traumatic insemination." I realize there's no such thing as "bad evolution"...but this is some bad evolution right here. "The bed bug, Cimex lectularius, has a unique mode of copulation termed "traumatic" insemination during which the male pierces the female's abdominal wall with his external genitalia and inseminates into her body cavity." "We show for the first time, to our knowledge, that traumatic insemination results in (i) last-male sperm precedence, (ii) suboptimal remating frequencies for the maintenance of female fertility, and (iii) reduced longevity and reproductive success in females. Experimental females did not receive indirect benefits from multiple mating. We conclude that traumatic insemination is probably a coercive male copulatory strategy that results in a sexual conflict of interests." Probably a coercive male copulatory strategy!? 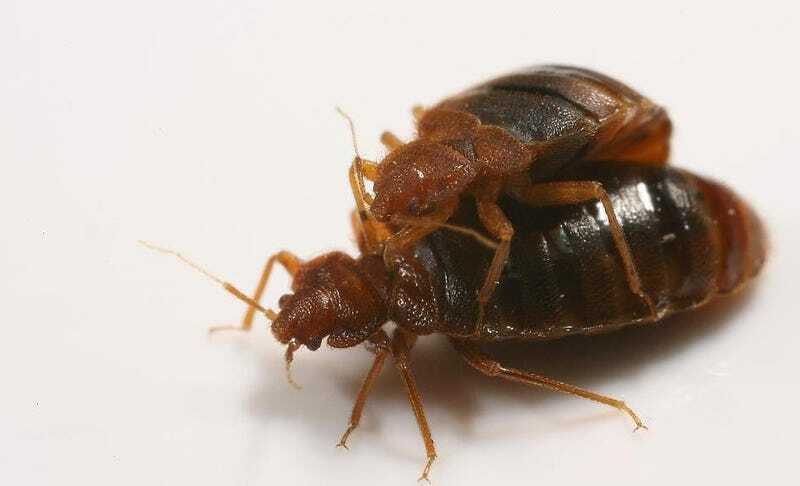 Look, I know I shouldn't be so judgmental about the nature of other species, so I'll say this as objectively as I can...male bedbugs are the worst things on Earth and need to be stopped by any means necessary, preferably with targeted nuclear strikes.